We've all been victimized (hopefully no more than once) by an older brother or sister or friend who asked us excitedly if we wanted to play a new card game, 52 Pick Up—Hah!—which in this clever script serves as the premise for a delightful and insightful 80-minute take on archetypal relationship interactions and outcomes. Each of the 52 cards in the playing deck represent a short, poignant interplay that we've all experienced in our relationships. 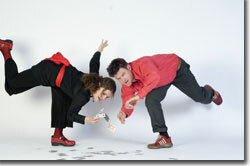 Its our natural inclination to presume that the 52 scenes originally occurred in a causal, linear sequence, but when "Woman" (Gemma Wilcox) and "Man" (Sam Elmore) begin the show by cutting the deck and throwing the 52 cards up in the air, they set in motion a number of unexpected implications. 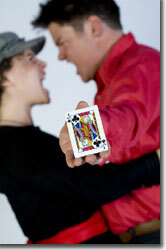 The order in which Man and Woman pick up the cards determines the order in which the scenes from the relationship are performed. As the press release explains to us, this means that the odds of any two shows being alike (the permutations and combinations of 52 events ["52!"]) is 1 in 80 658 175 170 943 878 571 660 636 856 403 766 975 289 505 440 883 277 824 000 00 000 000 performances. The result is that the causal relationship (the original 52 sequential events) is played out within an acausal framework (the random draw), thus infusing every scene with uncertainty over what is going to happen next. Talk about forcing the actors and the audience into the moment! The beauty of this approach is that the framework of the story is a perfect reflection of light (and thus the entire universe, i.e., Reality), which is both causal and a causal, as Heisenberg's Uncertainty Principle describes and as proven by the Quantum-Torus Model that is central Solomon's Proof (www.SolomonsProof.com). 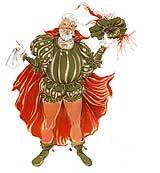 Following the performance on Friday, May 2nd, we learned from the actors that this evening's draw was particularly fortuitous, with certain foreshadowings and references sequencing in ways that would be considered brilliant if they had been consciously arranged thus by the playwright. In addition to the unintended mathematics and physics underlying the structure of 52 Pick Up, Wilcox and Elmore add a curious psychological layer by periodically manifesting similar, opposite, and contrapositive characteristics and behavioral dispositions of the other's persona, resulting in a Jungian interplay of anima and animus—male and female, conscious and subconscious—that reinforces the integrative experience. 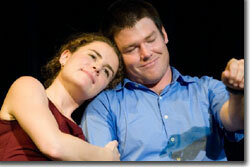 Over the years, we've seen a number of plays that explore relationship dynamics. Some of these have been told non-sequentially, for example Pinter's Betrayal, which is presented in reverse order of actual events; but 52 Pick Up is unique in that the same relationship is presented in a different sequence every night, leaving some of us—who have been around the block a few times—to wonder if we're doomed to randomly and continually repeat these interactions, or if there is some way to take our relationships to a higher level (Maybe as the major arcana of a tarot deck?). In any case, 52 Pick Up is a enlightening and fun take on the vicissitudes of love. Gemma Wilcox Productions presentation of TJ Dawe and Rita Bozi's 52 Pick Up, directed by Elizabeth Baron, runs Thursdays, Fridays, Saturdays, and Sundays at 8 pm through May 16th at the BINDERY | Space, 22nd and Stout, Denver. 1-800-838-3006 or www.brownpapertickets.com.